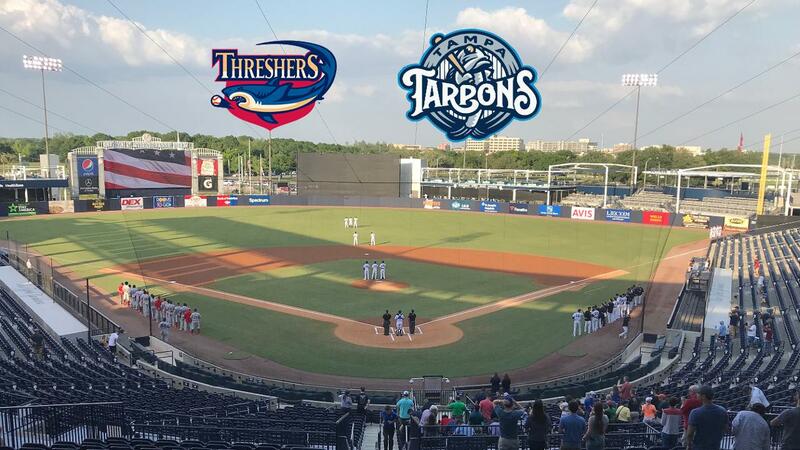 TAMPA, Fla. - The Clearwater Threshers made history on Monday night, while pulling to just a game and a half of the division lead in the Florida State League North after a doubleheader sweep of the Tampa Tarpons at George M. Steinbrenner Field. After erasing an early deficit to win game one in eight innings, 4-3, the Threshers became the first FSL team in nearly 26 years to win a game in which they were held hitless, squeezing past Tampa 1-0 in eight innings in game two. The last occurrence of an FSL team winning a game in which they had no hits was in fact the Clearwater Phillies on August 23, 1992, as part of a double no-hitter in which the Phillies managed to defeat Scott Bakkum and the Winter Haven Red Sox, 1-0. The lone run in that game scored on a pair of walks and a pair of sacrifice bunts. Clearwater plated the lone run in game two on Monday without the aid of a hit, nor a walk. With Luke Williams opening the inning at second base as the extra-inning free runner, a comebacker off the bat of Kevin Markham resulted in a dropped throw, putting runners at the corners after the error on shortstop Diego Castillo. Edgar Cabral chopped a slow grounder to short, advancing Markham to second, and with the infield in, Daniel Brito knocked a one-hopper to first. Williams broke on contact, and slid across the plate just ahead of the throw from first baseman Steven Sensley, resulting in the game's only run. Deivi Garcia tossed seven perfect innings in the start for Tampa, striking out 12. The 19-year-old retired all 21 batters he faced in the longest outing of his professional career. McKenzie Mills (2-5) nearly matched him, permitting only three hits (a triple and two infield singles) across seven scoreless innings. He walked one, hit two, and picked off three, while striking out four. Alberto Tirado preserved the victory, stranding Tampa's free runner at second while retiring all three he faced in the bottom of the eighth to earn his first save of the season. Clearwater (27-16) (59-52) now sits 1.5 games back of first-place Dunedin, while 26 left to play. The Threshers erased an early 3-0 deficit in game one, holding Tampa hitless through the final seven innings. The Tarpons (20-24) (55-59) grabbed the early advantage, after a leadoff error followed by a single and a Dom Thompson-Williams ground rule double plated the night's first run. With one down. Ben Ruta's bloop double to left plated two more to make it 3-0 Tarpons. Clearwater got one back against Garrett Whitlock in the second. Williams singled to right to open the frame, and swiped second for his 10th stolen base of the season. After Kyle Martin lined a base hit to left, Raul Rivas delivered a sacrifice fly, plating Williams to cut the deficit to 3-1. Gabriel Lino cut it to one by launching a 3-1 pitch out to left to make it a 3-2 game in the fifth. An inning later, Martin brought it even by blasting a two-strike pitch from reliever Hobie Harris well beyond the right-field wall, knotting the game up at three. After the three-run first, Mauricio Llovera settled in to retire each of the final 17 batters he faced. Llovera worked six innings in the no-decision, holding Tampa to three runs (two earned) on just three hits while striking out seven. With the teams knotted up at three through seven, the game headed to extras and JP Crawford started the inning as the free runner at second. Henri Lartigue pulled a grounder to the right side to advance Crawford down to third, and Williams came through with a sacrifice fly to left to push Clearwater in front, 4-3. Addison Russ (3-0) turned in a perfect seventh, and returned for the bottom of the eighth with Steven Sensely at second base as the free runner. Russ went to work, striking out both Kellin Deglan and Angel Aguilar, before issuing a two-out walk to Estevan Florial. Russ fell down in the count 2-0 on Hoy Jun Park, but after a quick visit from Crawford, ended the game on the next pitch by inducing a fly to center to secure the win. Game three of the four-game set will take place on Tuesday night at 6:30 p.m., and the game will be broadcast live on threshersbaseball.com beginning at 6:15 p.m.